is a feature-rich interactive anatomical atlas enhanced with quality text descriptions and over 160 frequently encountered clinical correlations organized per body system. Learn human anatomy with over 4000 realistic anatomical models/structures. Outstanding all-in-one solution for learning clinical, topographic and systems-based anatomy. Save time and effort. Learn human anatomy with over 4000 realistic anatomical models/structures. Outstanding all-in-one solution for learning clinical, topographic and systems-based anatomy. Save time and effort. The 3D anatomy models can add important cognitive input for understanding the spatial relationship between anatomical structures and features leading to an increased retention of knowledge. Suitable for medical and allied health students and professionals. Also, suitable for patients and laypeople who want to learn more about the inner structure and function of their body. Offers convenient patient education in hospitals and private practices. Can be used to increase student engagement in the classroom. 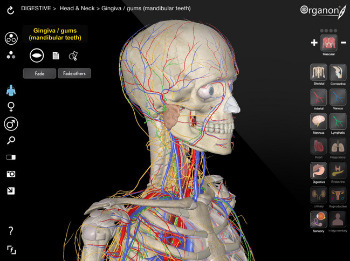 The 3D Organon Anatomy app includes detailed male and female models. The following body systems are included for each gender: Skeletal, Connective, Muscular, Arterial, Venous, Nervous, Lymphatic, Heart, Respiratory, Digestive, Endocrine, Urinary, Reproductive, Sensory organs, and Integumentary (skin).